Yesterday Lucy nursed for the very last time. I know it hasn't fully hit me yet, so I know that there will be tears in the future about this, I'm sure. I just can't believe we're done. Lucy has really seemed to handle weaning great; it just shows how much of an independent girl she is. She seems completely unphased by all of it. So, this morning was the first time she didn't nurse right away in the morning. I think I did a fairly good job of keeping her morning similar though, so hopefully that helped her. Usually, Lucy would wake and I would nurse her around 6:30am, then we (Gus, Lucy and I) would eat breakfast around 7am. So, instead of sitting down this morning to nurse her, I sat down and read to her. Only once did she make a move towards me, my shirt or my breasts, and I'm thinking it was just her trying to push me around and had nothing to do with wanting milk. Seeing as how today is the first day of no nursing, I'm sure I might have some discomfort as my body gets the clue that it can stop making milk. With Gus, I had a plugged duct that I was able to clear on my own. I just hope that this week goes as well, or better. It's strange to me, a I type this, that for so long, since 2007, the general direction of my life has been TTC-related...and now that's likely all done. I know I have a lot of feelings on this, but they have not yet surfaced, so I'll save that for another day. To honor the day yesterday I dropped off the last of Lucy's breastmilk that was in the freezer. Combining all that I've donated, Lucy donated 574.08oz and Gus donated 141.25. 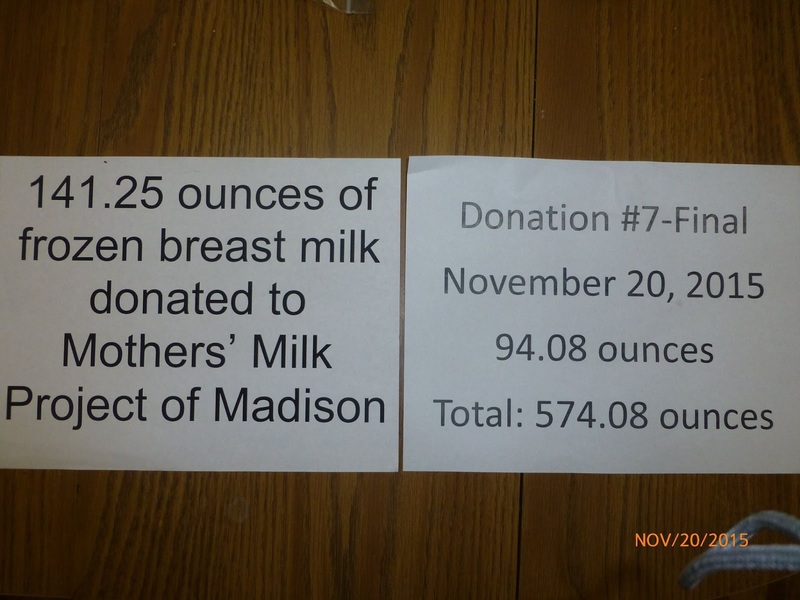 That's slightly more than 5.5 gallons of breastmilk that has been donated from my living kids. I know that I'll never know for sure what happened to my milk, who received it and if it helped, but I just really hope that at least one little baby lived and got to go home with his/her family because of my milk. I hope there isn't too much discomfort for the next few days. You are amazing! 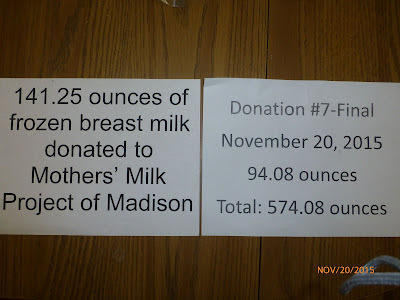 As a mother of twins who were born at 28 weeks and used donated breast milk thank you so much! !